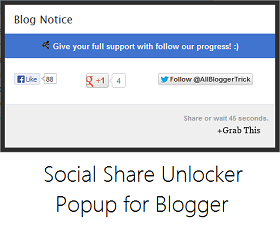 Today I am going to show how you can add Social Share Unlocker Popup for Blogger. After adding the code in your blog, you will see a one time popup which will require you to either Like, Google +1 or Follow you to see the contents of the blog. The timer can be adjusted according to your needs by default it is 60 seconds. You can also make the blog closeable and add a cross button by tweaking the settings. This box works on jQuery and also looks elegant. This widget will be very effective in increasing your social counter and spreading your blog. Overall the CSS has been nicely coded to make the design look beautiful. You can see the live demo of this plugin by clicking the below button. Once you have seen the demo we can proceed with the tutorial on how you can add Social Share Unlocker Popup to your blogger blog. Firstly go to Blog Title → Template → Edit HTML and search for the code </body> and paste the below given code just above it. After adding the code follow Step 2 for the settings. Change the text in blue with your username of Facebook and Twitter. Change the URL to the one in which you want to get Google +1. Change 60 with your desired no. of seconds you want the popup to appear. Change false to true if you want the popup to be closeable and add a cross button in the popup. After configuring the code save the template. You are done now. Now you can gain more social shares whenever a new and unique visitors visits your blog by adding this Social Share Unlocker Popup for Blogger plugin. How do i change the text part. The english there is incorrect. Can we change? Its in the external link. So maybe you can't edit it. how come the fb like button doesn't work on my page? Can you be more specific please. yeah my fb like button doest work only google plus and twitter help! FB button doesn't show up for me too. Can I get your blog URLs so that I can figure out the problem.